I disappeared on the night before my twelfth birthday. Gorgeous new colour illustrations for the best-selling Kensuke's Kingdom. Washed up on an island in the Pacific, Michael struggles to survive on his own. With no food and no water, he curls up to die. When he wakes, there is a plate beside him of fish, of fruit, and a bowl of fresh water. He is not alone . . . Kensuke's Kingdom is a gripping adventure from the author of War Horse. 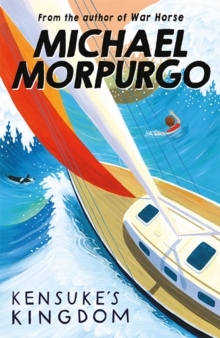 Michael Morpurgo has written more than one hundred books for children and won the Whitbread Award, the Smarties Award, the Circle of Gold Award, the Children's Book Award and has been short-listed for the Carnegie Medal four times. Kensuke's Kingdom was shortlisted for the Whitbread Prize and won the FCB Award. `A dazzling adventure' - The TimesLoved by children, teachers and parents alike, Michael Morpurgo, the former Children's Laureate, has written more than forty books and won the Whitbread Award, the Smarties Award, the Circle of Gold Award, the Children's Book Award and has been short-listed for the Carnegie Medal four times.